Native Americans are some of the world’s most important peoples. If not for them, America today might not have the governmental system that it has today. If not for Native Americans, the world might not have many of the foods, clothes, medical and even scientific advancements that it has. That is a massive statement, considering how intelligent Native Americans and their ancestors are and were. Now thanks to PBS, Native Americans and their ancient ancestors have finally received the recognition that they have deserved for decades (if not eons) in the new docu-series Native America. The nearly four-hour series (specifically three hours and 40 minutes) is a wonderful lesson on the importance of Native Americans, their ancestors and the importance of their contributions to the world. It shows unquestionably that Native Americans and their ancestors deserve so much more respect and recognition than they get even today. That is proven through the stories told in each of the program’s four separate segments. Speaking of that segmentation, it is its own important part of this two-disc set’s presentation, and will be discussed a little later. The double-disc set’s average price point makes it a presentation that viewers of every background can afford. In turn, people of every background should spend the money and purchase this set. They will be glad they did. They will agree in watching this set that it is easily one of this year’s best and most important new documentaries. PBS’ new new docu-series Native America is one of this year’s best and most important new documentaries. It is a “series” that people of every background must see. That is because it is one of the most in-depth and respectful presentations of Native American history and culture that has been presented to audiences in recent memory. That statement is supported primarily through the program’s content. That content displays, in full depth, all of the contributions and advancements made by Native Americans and their ancestors. One of the four episodes included in the series focuses intensely on the role of Native Americans who lived in what is now New York in the formation of today’s American government. It openly states that Benjamin Franklin cited those tribes’ governmental establishment as the influence for the system created by the founding fathers. The docu-series’ opening episode goes into just as much depth to present the incredible level of intelligence of ancient Native Americans, such as the Pueblo and Zuni tribes, living in the American Southwest in their measurements of the solar and lunar cycles. Audiences will be awed seeing firsthand, the precise calendars etched onto rock walls that tracked those cycles, and the role that said tracking played in the tribes’ planting and harvesting. Just as interesting to learn is how one ancient ruler used corn as the source of his people’s very culture. “New World Rising,” the “series”’ finale, points out the atrocities committed against the Native Americans and their ancestors by Europeans who came to the Americas, and the result of those atrocities. Audiences will be shocked to learn of the role of the Catholic Church in those atrocities among other items. Between all of the items noted here and so much more that is discussed throughout the course of the “series”’ nearly four-hour run time, the whole of the program is certain to keep viewers completely engaged throughout. What’s more, it is just as certain to be quite enlightening for plenty of audiences, just as it was for this critic. Keeping this in mind, the content shared throughout the program provides in itself more than enough reason for audiences to watch the program, not just during Native American Heritage Month, but during any time of the year. 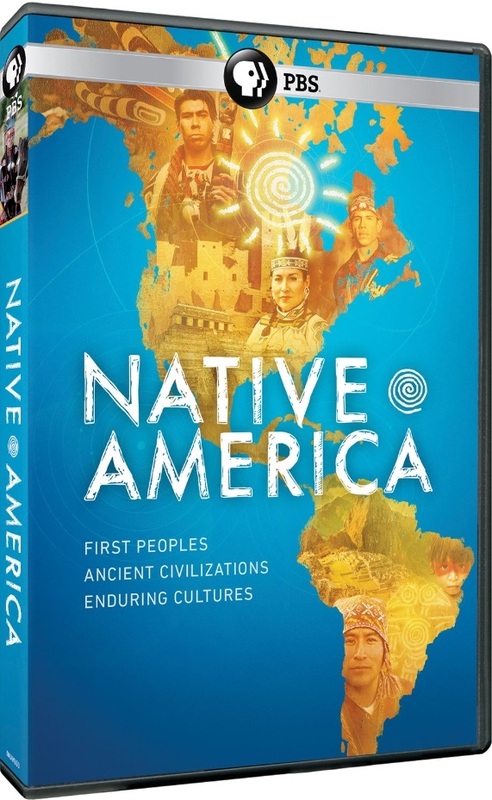 The content presented throughout Native America’s four separate segments creates a solid foundation for the double-disc set, and – as already noted – gives viewers more than enough reason to watch the program. Speaking of the segments, those behind the program’s construction are to be commended for that segmentation. Each segment is its own presentation, lasting roughly one hour in time. The segments each have a beginning, middle and end. Given, there are a few minor transition issues, such as those in the program’s second segment, “Nature to Nations” and in “Cities of the Sky.” Audiences will note that in both segments, the stories reach some points that feel like random changes of thoughts, almost like they were constructed in a stream of consciousness style. Luckily though, those transition issues are not enough to derail the viewing experience and, in turn, viewers’ engagement. Staying on that note, the fact that each segment is its own presentation, audiences are not made to feel that they have to watch the whole thing in one sitting in order to take it in entirely. This is hugely important to the program’s new DVD presentation as it will add to viewers’ appreciation for the presentation in whole. When it is considered along with the depth and breadth of the program’s content, the two elements together make the program that much more appealing for viewers. Even with that in mind, it still is not the least or last of the DVD’s important elements. Keeping in mind, the appeal of the DVD set’s content and its overall construction through its segmentation, its average price point proves to be its own important part of the whole. The average price point for Native America – using prices listed at PBS’ online store, Amazon, Best Buy, Walmart, Target, Barnes & Noble and Books-A-Million – is $21.89. Even adding in shipping and handling, that price increases, obviously. Regardless, that increase is still not enough that it should dissuade consumers from purchasing the two-disc set. Prices obviously vary from one outlet to the next, and regardless, each price is still worth the money paid because of the program’s ability to pull in audiences and keep them engaged. What’s more audiences will find themselves more enlightened by the program’s end, and perhaps even having more appreciation for Native Americans, their ancestors and the cultures of each tribe and peoples. Keeping this in mind, the whole of Native America proves to be a two-disc presentation that is, again, the best history of Native Americans to be presented in many years. Independent metal outfit What You Need debuted a new live recording early this month. The band debuted the audio recording of its performance of its song ‘Burn Together’ on Nov. 5. The performance was recorded at a recent performance at Blackthorn 51 in Elmhurst, New York. The band said in a collective statement that the recording marked the first time the band performed the song live. It’s hard to believe, but in a little more than a month, 2018 will officially over, and 2019 will be here. It goes without saying that this year has been another impressive one for the metal community, with powerful new releases from acts, such as Soulfly, Tesseract and Nonpoint just to name a few acts. Though the year is almost over, the year’s stream of new releases is not yet over. Veteran metal outfit Artillery released its latest album The Face of Fear on Nov. 16, and it will make critics’ decisions on their year-ender lists that much more difficult. That is because the Danish band’s ninth full-length studio recording’s far-reaching appeal among thrash and metal fans alike. This is evidenced right from the album’s outset in its opener/lead/title single. ‘Sworn Utopia’ does just as much as the album’s title track to support that statement, and will be discussed shortly. Much the same can be said of ‘Preaching To The Converted,’ which will also be discussed later. Each song shows in its own way, what makes The Face of Fear yet another strong addition to this year’s already outstanding list of new hard rock and metal albums. When they are considered along with the album’s other songs not noted here, the whole of the record’s 11-song, 45-minute a work that every thrash and metal purist will appreciate. Artillery’s latest full-length studio recording, The Face of Fear continues what is for the veteran Danish metal outfit, a long-running tradition of success. It is a work that will appeal to a wide range of thrash and metal purists from the band’s homeland to America and beyond. That is proven in part through the album’s opener/title track/lead single. ‘The Face of Fear’ is an important opener and addition to the album considering the state in which the world currently exists. As the band noted in a discussion on the song’s lyrical content, “the song is about dealing the end of man by himself. We create our own phobia about the destruction of the world, but remain disrespectful to the globe.” Front man Michael Bastholm illustrates that message here, singing right off the top, “The world is gonna fall,” adding in the chorus, “Under crimson skies/Our hopes and dreams, they die/This reality/Why can’t we see.” Additionally, he sings, “No heeding the signs/No wait for tomorrow/Ready between the lines/the face of fear/The scenes will be erased/The trials that we face/Miasma amber mist/the face of fear/It whispers in your ear/It all will end in tears.” From here, Bastholm reprises the song’s chorus, driving home even more, the song’s blatant warning of what we as a species are doing to the planet. The song’s official video serves to illustrate Bastholm’s message even more, featuring images of warplanes dropping bombs, missiles being fired, power plants spewing gases into the atmosphere and mushroom clouds, clear-cut forests and mounds of trash piled up in a landfill. The images, coupled with the song’s intense lyrical message makes The Face of Fear a star wake-up call of what truly is fear-inducing. 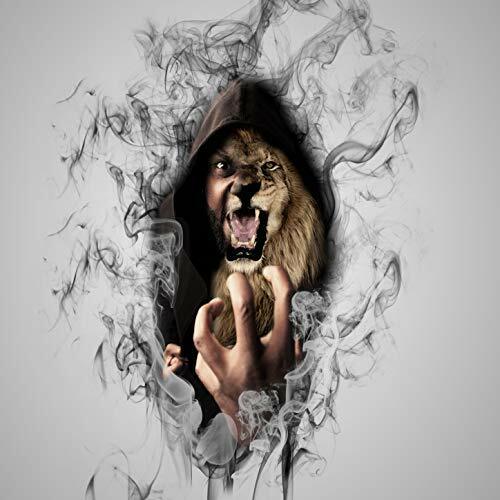 The coupling of the song’s straight forward warning in its lyrical content and the visuals, which drive the song’s message home even more does plenty to make ‘The Face of Fear’ an important addition to The Face of Fear. That is because of the clarity that they create together. While they are obviously an important part of the song, they are not its only important elements. The song’s musical arrangement is just as important to discuss as its lyrical theme. Bastholm’s power metal vocal delivery style set against the song’s old school thrash arrangement creates an interesting dichotomy for which audiences have already shown their appreciation. One could argue that juxtaposition harkens back to a style made popular by acts, such as Megadeth, Metallica and Anthrax in the early 1980s. Keeping this in mind, the combination of the song’s musical arrangement, its lyrical content and even its visual content clearly shows why ‘The Face of Fear’ is an important to its namesake album. It is just one of the examples of what makes the album in whole another successful offering from the band, too. ‘Sworn Utopia,’ which comes a little later in the album’s run, is another example of the album’s strength. ‘Sworn Utopia’ stands out in its own way in the overall picture of The Face of Fear in part because of its own musical arrangement. As with the album’s title track (and so many of the album’s other songs), Bastholm’s power metal vocal delivery style couples with the thrash style approach that is so prevalent throughout the album for another powerhouse arrangement. The song’s bridge conjures clear thoughts of Megadeth while the verses and chorus add a touch of Judas Priest influence. Again, that collection of musical influences, which throws listeners back to the heyday and thrash (and power) metal cannot be ignored in its importance. It is only one part of what makes the song, though. The song’s lyrical content is just as important to discuss here as the song’s musical content. The song starts off with the ringing of church bells before Bastholm and company launch into the song, with Bastholm singing, about altar confessions, priests’ celibacy, altar boys and faith put to the test. He even goes so far as to directly indict the church (apparently the Catholic church) as he sings, “Your law’s religion/Dramatic and vile/Imprisonment…like a child/You must stay absent from glory and joy.” Little doubt is left as to the song’s target, considering what can be deciphered from Bastholm’s rapid fire delivery. If any doubt left at this point, his further statement of “For all I care/Make your peace/But don’t you take/It out on kids.” At this point, there is no doubt left as to the song’s lyrical topic. It is a full-on indictment of the Catholic church and the sexual abuse scandal that has rocked the church. Given, it’s not the first time that a band ever took on any religious establishment, but considering the reality of the issue and its importance, it is another pressing matter. To that end, the fashion through which Bastholm addresses the issue here is powerful in its own right. The addition of the fury in the song’s musical arrangement helps to illustrate the urgency with which the issue must be addressed and the importance of the matter. When both elements are considered together, they make the song another clear example of The Face of Fear’s strength. Even with this in mind, ‘Sworn Utopia’ is still not the last example of what makes The Face of Fear another positive offering from Artillery. ‘Preaching to the Converted’ shows just as much as ‘The Face of Fear’ and ‘Sworn Utopia’ The Face of Fear’s strength. ‘Preaching to the Converted’ is another full-throttle trash opus that fans of the genre will welcome with arms wide open. Right from the song’s outset, the old school Megadeth and Metallica influences are on full display, as is even a touch of Exodus. That is evident in the screaming guitar solos and solid time keeping from the drums. Lyrically, the song comes across as a socio-political commentary of sorts. This is inferred as Bastholm sings of people being “shackled” by politicians, those in positions of power “feeding lies” to the populous and mind control of sorts created, again, by those in power. It is an interesting work that is certain to generate plenty of discussion if it has not already done so. Discussions aside, it can be said with certainty that this is another work that indicts those in power for what they are doing to the masses. That includes the world’s political leaders and maybe even military leaders. Again, it is not the first time that a band has taken this road, but it is no less powerful here than in other acts’ presentations. To that end, that message, coupled with the song’s full force musical presentation makes the song in whole yet another clear example of what makes The Face of Fear another welcome offering from Artillery. It still is not the last song that can be cited in supporting that statement, either. One could just as easily cite the seemingly tongue-in-cheek nature of ‘Dr. Evil,’ the direct discussion of what goes around comes around in ‘Crossroads To Conspiracy’ and the warning about the dangers of alcoholism in ‘Pain,’ the album’s strength becomes that much clearer. The somewhat Dio-esque ‘Thirst For The Worst’ adds even more depth to the album as does the Metallica-esque sound of ‘New Rage’ and its seeming message about someone who has been wronged. 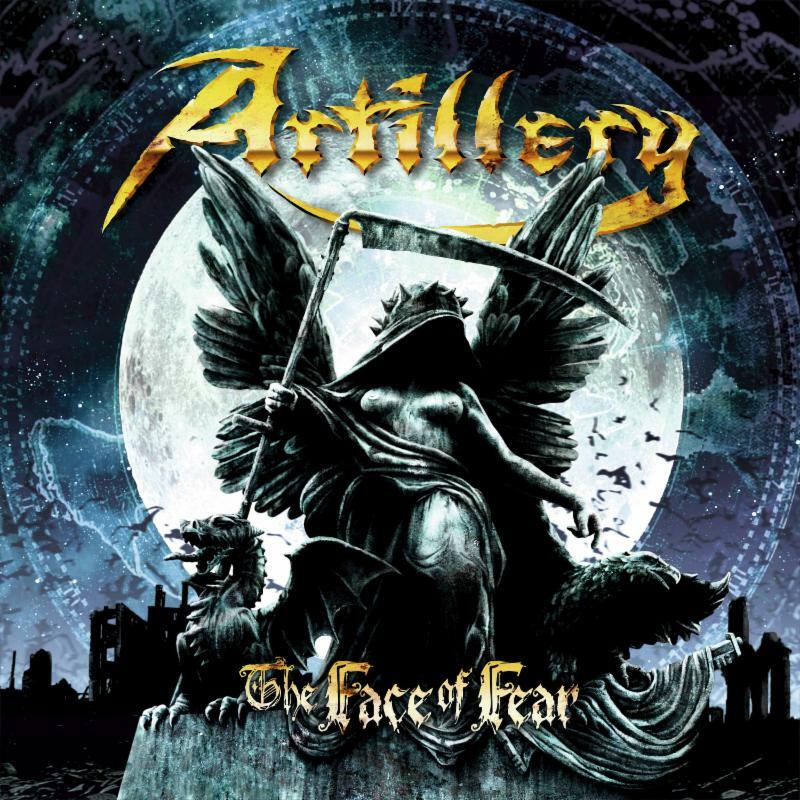 Between all of those songs and the works directly discussed here, the whole of The Face of Fear clearly shows itself to be another welcome offering from Artillery that shows this band still has plenty of ammunition. PBS’ hit educational series Sesame Street has for decades, been a source of great educational and entertainment for audiences of all ages. From teaching numbers and words to teaching equally invaluable lessons about cultural diversity and more, Sesame Street has proven time and again to be one of the most important series on television. Even as the decades have passed and times changed, the series has changed along the way to stay up with the world, but has not changed to the point of losing any of what it has done. 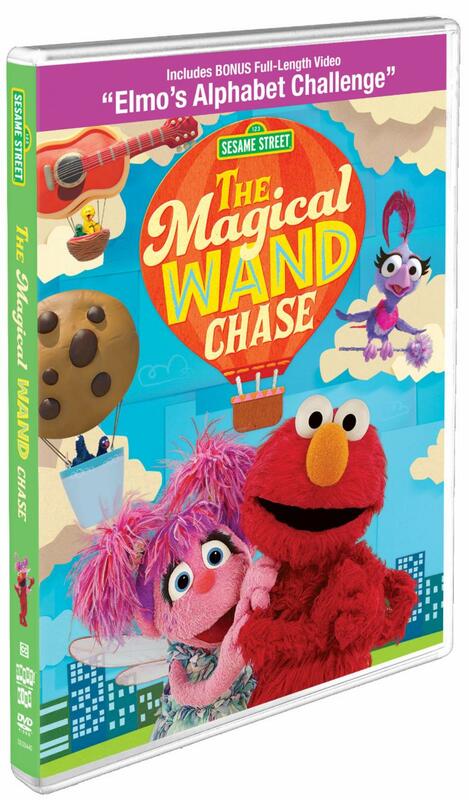 The show’s latest DVD, Sesame Street: The Magic Wand Chase is proof of that, both in its primary and bonus content. Each item will be discussed here, as each is equally important to the DVD’s overall presentation. Those items make the DVD’s average price point, the last of its most important elements, money well-spent. Each item is important in its own right to the DVD. All things considered, they make Sesame Street: The Magic Wand Chase more proof of why Sesame Street remains today one of television’s most important programs. Sesame Street: The Magic Wand Chase is an enjoyable new offering from Sesame Workshop and Shout! Factory that clearly proves the series remains today, one of the most important series on television. That is even considering programs in other genres. This statement is supported in part through the DVD’s primary content, the feature presentation that gives the DVD its name. The primary content finds Abby Cadabby, Elmo, Big Bird, Cookie Monster, Grover and Rosita chasing down a bird in order to recover Abby’s magic wand after Abby accidentally drops the wand during a balloon ride. Abby and the others were taking a balloon ride in a trip of balloons, and when she tried to get herself and her friends back to Sesame Street, she dropped the wand, leading to the chase. Looking at the “movie” from an analytical standpoint, this is actually a good way to set up the chase that follows. As Abby and company chase down the bird, who uses Abby’s wand to hide her identity at points, the group encounters children with various ethnic backgrounds – Chinese, Mexican and African – leading to lessons about their people’s cultures and the value of those differences. Of course there is plenty of hilarity along the way thanks to plenty of family friendly jokes (including a laugh riot tribute to Benny Hill), and Abby eventually gets her wand back. Those lessons of cultural diversity, though, is the most important item to note. As noted previously, this is nothing new for Sesame Street. What is important here is the way in which the show’s writers executed the lessons. They used a new, enjoyable way to present the lesson on cultural diversity. To that end, the story and its familiar and welcome lessons promoting cultural diversity form a solid foundation for the DVD. The bonus content included with the DVD strengthens that foundation even more. The bonus content included with Sesame Street: The Magic Wand Chase strengthens the DVD’s foundation even more because it picks up right where the DVD’s primary content leaves off. The full-length featurette “Elmo’s Alphabet Challenge” continues Sesame Street’s long-running focus on teaching the alphabet and words to young viewers. As with the DVD’s primary content, it does that here once again, but in a fashion that is in line with the current age. Telly, Elmo and Abby are pulled into the video game world while deciding on a game to play on Abby’s tablet. Over the course of roughly an hour, Abby and her friends go through a variety of different video games, which are takeoffs of video games, such as Super Mario Brothers, Angry Birds and World of Warcraft in order to find letters that align with each letter of the alphabet. The ultimate goal is to defeat a character named ABC-More in the process so that they can get back to their world. Obviously it has a happy ending. The video game spoofs will entertain grown-ups while the additional (yet possibly latent) lesson about pride – ABC-More constantly calls himself the greatest, leading to a starting point on that noted lesson about pride – and the primary lesson teaching about the alphabet and words join in to make this bonus feature in whole just as entertaining for the whole family as the DVD’s primary story. “The Golden Triangle of Destiny,” the second of the DVD’s bonus features, is just as certain to entertain the whole family. It is also the shortest of the DVD’s features, both primary and secondary. It is a full-on spoof of the Indiana Jones movie franchise that finds Telly going on a search for the titular triangle around Sesame Street. Along the way, he has to avoid a giant boulder (yes, a boulder), a bunch of “exploding” washing machines and determining the shape of each figure that he finds. So what audiences get here is the basic geometry lesson as its educational content alongside a fun movie spoof that will entertain audiences of all ages and likely be a favorite watch for those audiences. When it is coupled with the lead video game-based bonus, the two bonuses together succeed solidly in offering plenty of entertainment and education at the same time. When the bonus content is considered alongside the DVD’s primary content, the whole of the content offers plenty for audiences of all ages to appreciate throughout the DVD’s two-hour-plus total run time. Keeping all of this in mind, the DVD’s average price point proves to be another positive for the DVD. The average price point for Sesame Street: The Magic Wand Chase is $11.75. That price is attained by averaging prices from Shout! Factory’s online store, Walmart, Best Buy and Barnes & Noble. The DVD is not listed – at the time of this post – at Amazon, Target and Books-A-Million. Considering the breadth and depth of the content presented over a total run time of more than two hours (specifically, two hours, two minutes), that price is not overly expensive. When one takes into consideration that the DVD also includes a downloadable .pdf file of The Magic Wand Chase for families to enjoy any time they want, that price becomes that much more affordable and welcome for every family. Keeping this in consideration along with the primary and secondary content featured in the DVD, it is just one more positive for the DVD. Keeping this in mind, all three elements come together to make the DVD overall another successful offering from Sesame Workshop, and an equally welcome new offering from the new partnership between Sesame Workshop and Shout! Factory. Jimi Hendrix, over the course of his professional career, released a grand total of only three full-length studio recordings – Are You Experienced, Axis: Bold As Love and Electric Ladyland. By today’s standards, releasing three albums is not that much of an accomplishment for any music act, yet somehow, Hendrix has remained one of the single most influential figures in the music industry to this date. That is, again, despite having only released three full-length studio recordings. It is an interesting concept. He is considered so influential because of the creativity exhibited in the songs that he composed, both musically and lyrically. That third noted album is one of the most powerful exhibitions of Hendrix’s creative range and his talent, and early this month, the music industry celebrated the 50th anniversary of its original release, with a special re-issue of that record. 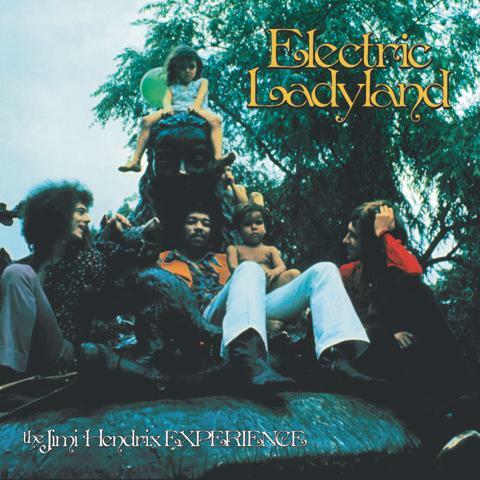 Electric Ladyland: 50th Anniversary Deluxe Edition was released Nov. 9 via Sony Legacy and Experience Hendrix, LLC. The four-disc collection is a wonderful new presentation of the landmark album. That is due in no small part to its overall primary content, which will be discussed shortly. The book in which that content is contained is just as important to the set’s presentation as the primary content. It will be discussed a little later. The set’s average price point rounds out its most important elements, and will also be discussed later. Each item is important in its own right to the whole of Electric Ladyland: 50th Anniversary Edition. All things considered, they make this new deep dive into Hendrix’s groundbreaking final album one of the year’s top new album re-issues, if not the year’s best. 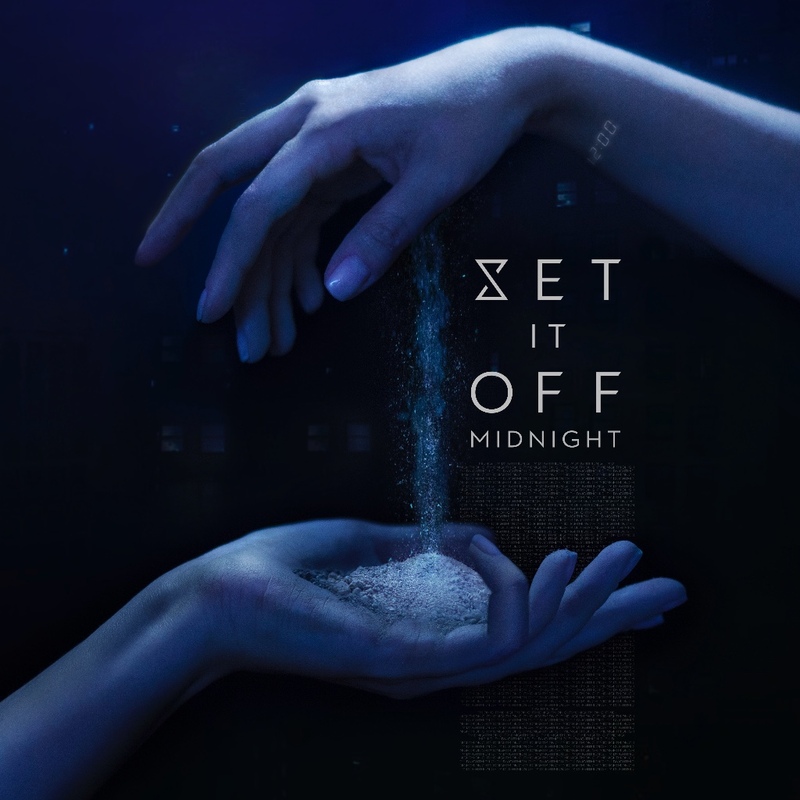 Set It Off is giving listeners another preview of its upcoming album. The band debuted the video for its new single ‘Lonely Dance‘ on Monday. The song is the second single from the band’s forthcoming Fearless Records debut album Midnight, which is currently scheduled to be released Feb. 1. The sci-fi style video places the band on board a spaceship, facing a dangerous alien force much in the vein of so many sci-fi horror flicks. Meanwhile, the song’s upbeat arrangement plays against the video, accompanying a seemingly positive lyrical message. Carson explained that lyrical message in an interview, saying that ‘Lonely Dance’ focuses on a very targeted audience. Carson elaborated on the video’s concept saying that it illustrates the song’s message very well. The premiere of the the video for ‘Lonely Dance’ comes almost four months after the band premiered the video for Midnight‘s lead single, ‘Killer in the Mirror.’ Despite it’s semi-poppy sound, that song is a hard-hitting piece that seems to center on those people who can dish it out, but cannot take it. Pre-orders for Midnight are open now. The full track listing is noted below. 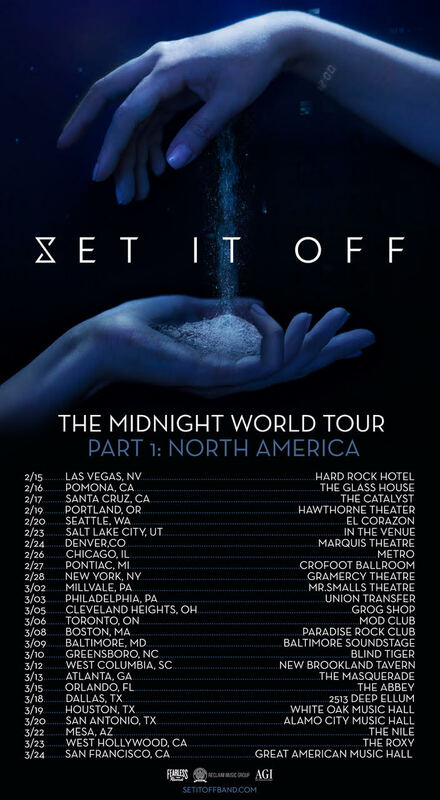 Along with the announcement of its new video, Set It Off also recently announced it will tour in support of Midnight this winter. The band’s current schedule is set to launch Feb. 15 in Las Vegas, Nevada and to run through March 24 in San Francisco, California. The tour also features dates in Greensboro, North Carolina; Portland, Oregon and Denver, Colorado. The tour’s current schedule is noted below. Midnight is Set It Off’s fourth full-length studio recording. The band’s full-length debut Cinematics was released in 2013 via Equal Vision Records. It was followed up in 2014 by the release of Duality, Duality: Stories Unplugged in 2015 and Upside Down in 2016. Prior to the release of Cinematics, the band released its debut EP Baby,You Don’t Tripjaharda in 2008. Its sophomore EP Calm Before The Storm followed in 2009 and its third EP Horrible Kids in 2011.